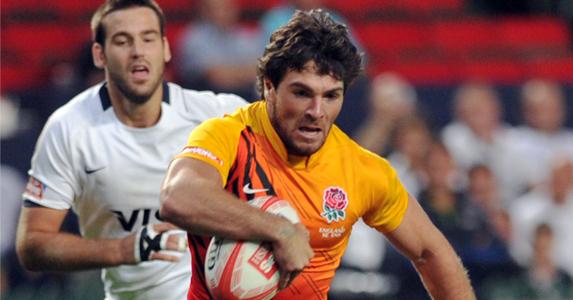 England’s Mathew Turner was today shortlisted as a contender for the IRB International Sevens Player of the Year award. The former Bristol wing faces competition from two New Zealanders – half back Tomasi Cama and wing Frank Halai – for the accolade, which will be presented after the ninth and final leg of this season’s HSBC Sevens World Series at Twickenham next weekend. Turner, 24, has enjoyed a spectacular season playing at centre of half back, scoring eight tries in six games at last weekend’s Glasgow Sevens, where England were beaten 29-14 in the final by New Zealand. One of 12 full-time contracted sevens players on England’s books, he has scored 33 tries this season – only two less than teammate Dan Norton, who leads the series try table going into the Marriott London Sevens. England have provided two of the previous winners of the IRB award, Simon Amor scooping the prize in 2004 and Ollie Phillips in 2009. Cecil Afrika (South Africa) picked up last season’s honours. In the draw for the Marriott London Sevens, England will compete in Pool B against the USA, France and Samoa on day one.